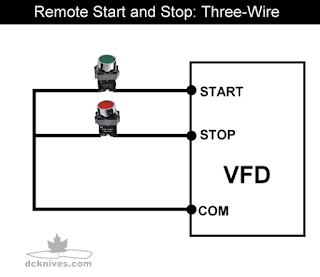 Some VFDs have a speed control knob on the front of the VFD itself or on the enclosure which protects the VFD. On other VFDs the knob needs to be installed somewhere and wired up to the control terminals. 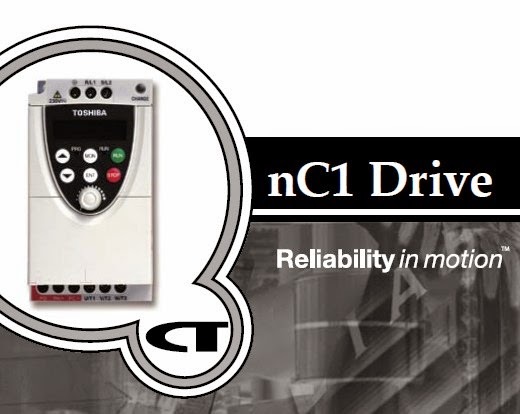 If you want to be able to easily vary the speed (which for us really is the whole purpose of having a VFD), then you want to have a speed control knob somewhere within reach. 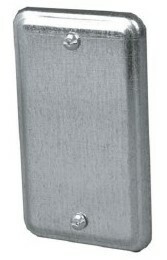 All VFDs will let you adjust the speed via their keypad, but this can be cumbersome, especially if you have gloves on. What you want is a good sized knob to turn. The device we use to control the speed is called a variable resistor. 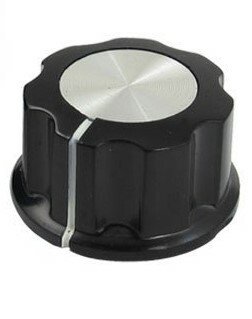 It is your basic old-school "volume control knob" that we used to find on stereos. 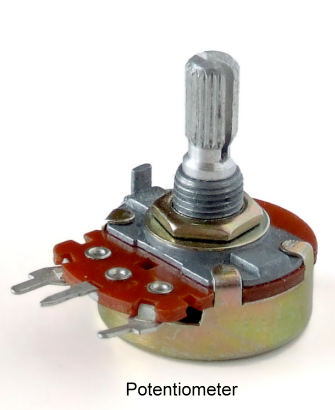 This variable resistor is wired as a potentiometer; meaning it will vary the potential or voltage. A variable resistor has three terminals. 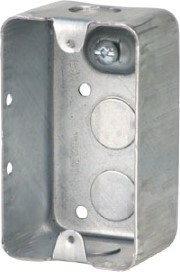 Two of the terminals are connected to a resistive material that is usually carbon or wire, the third terminal is connected to a moving part called the wiper. The two outside pins of the variable resistor are connected to the VFD's analog supply (+) and ground (-) terminals. The centre pin (called the wiper) is connected to the VFD's speed control analog input. 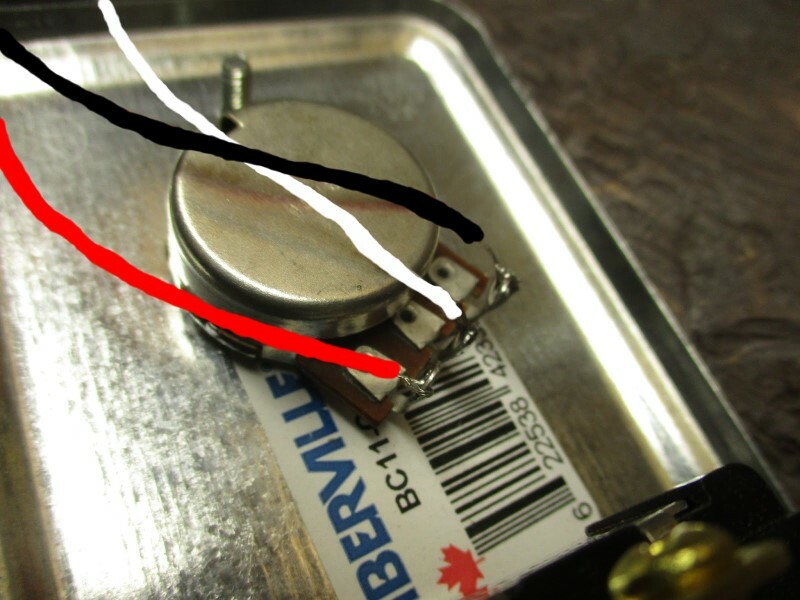 When we rotate the variable resistor we change the voltage going to the speed control input. This is usually a small DC signal range from 0 to 5 Volts or 0 to 10 Volts typically. 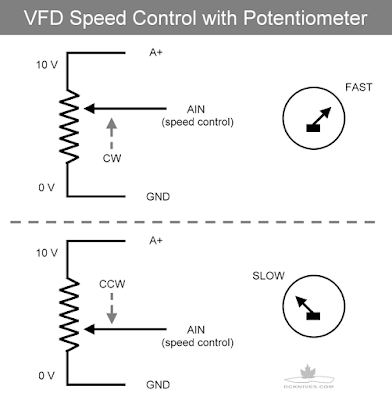 The figure below shows how moving the wiper towards the A+ terminal increases the voltage at AIN and would be used to make the VFD to speed up. 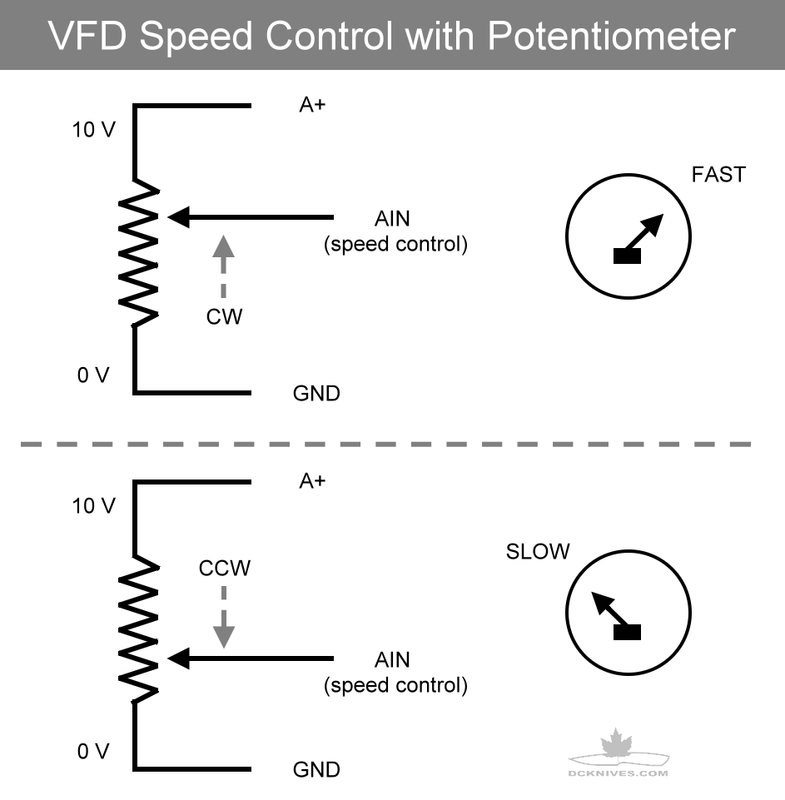 The lower part of the graphic illustrates how moving the wiper towards the GND terminal lowers the voltage at AIN and would cause the VFD to slow down. 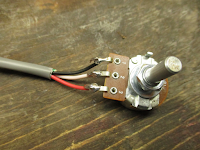 Your basic parts list will be a 5 k Ohm variable resistor and a piece 18 AWG or 20 AWG hookup wire. This wire needs to be three times longer than the distance from your VFD control terminals to where you want to mount the speed control. Lastly you will need a knob that mounts on the shaft of the variable resistor that is easy to turn. 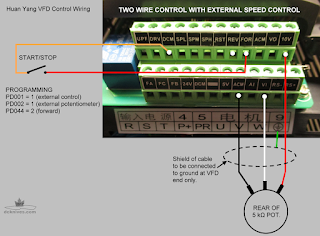 If your remote speed control is going to be more than 6 feet away from the VFD, you should be using shielded pair cable with at least three wires inside it. 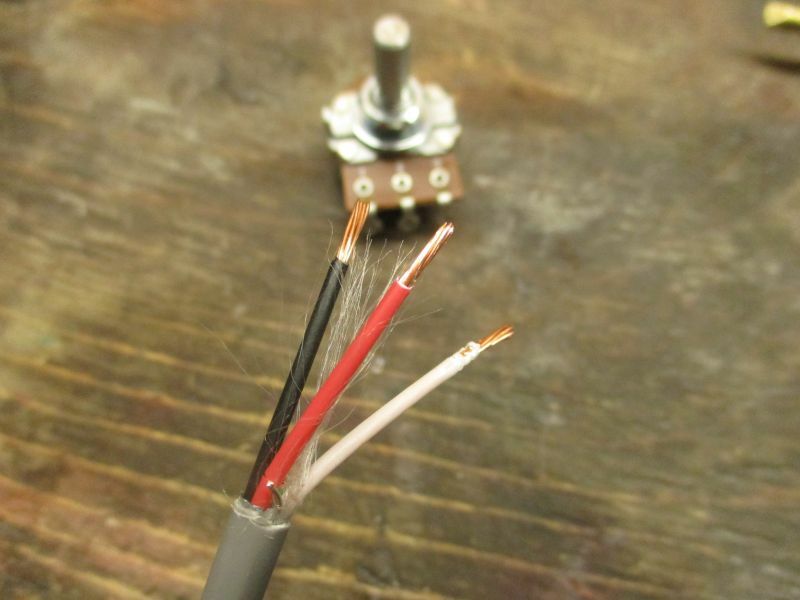 This special cable will aid in keeping electrical noise away from the speed control signal. 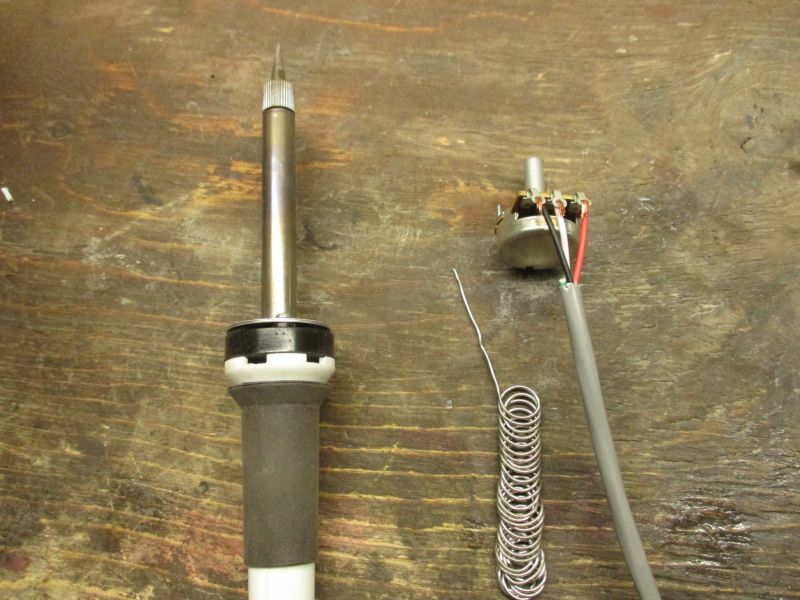 Remove about 1" of the jacket from the cable and trim and shield foil and drain wire. Strip about 3/16" insulation from each conductor. 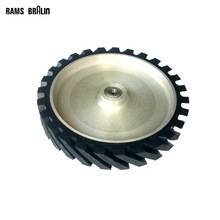 Feed the wire through the terminal and fold it over to make a mechanical connection. You will need a soldering iron, some solder and wire stripper and a screwdriver to do the next part. 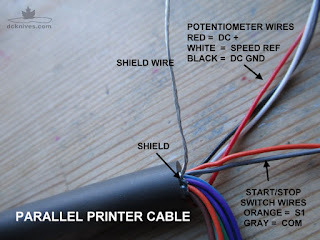 Hold the soldering iron tip where the wire and terminal meet and flow some solder to cover the wire and terminal. Remove the soldering iron and hold everything still while the solder hardens. Note that I used black for ground, red for DC+ and white for the variable (AIN) lead. When viewing the variable resistor from the front like in the photo, the right side will be connected to the + from the VFD, sometimes called +V or DC_5V or 10V. This will be different for different VFD manufacturers. Always check your VFD manual. The center terminal, called the wiper will go to the VFD and tell it what speed you want to be running at. Some VFDs call terminal AIN, AVI or SPEED_REF. Again check in your manual. 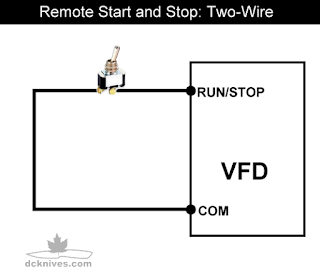 Along with remote speed control, all modern VFDs allow for remote starting and stopping of the motor. 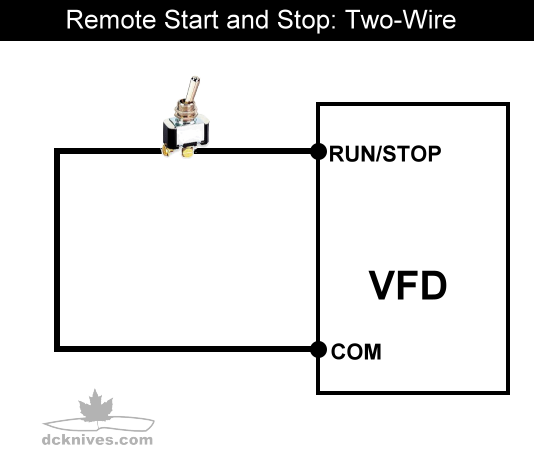 A signal is provided by the VFD to send back to one of it's own inputs. 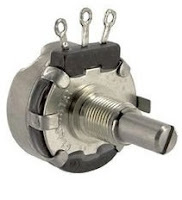 The usual single switch operation (sometimes referred to as two-wire control) will start the motor when the switch is closed and stop the motor when the switch is opened. 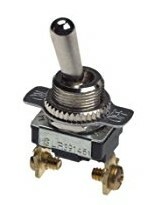 An example of a suitable switch is a common toggle switch. When two momentary push buttons are used to control the operation of the motor this is referred to as three-wire control. One button is pressed to start the motor and the other button is pressed to stop the motor. 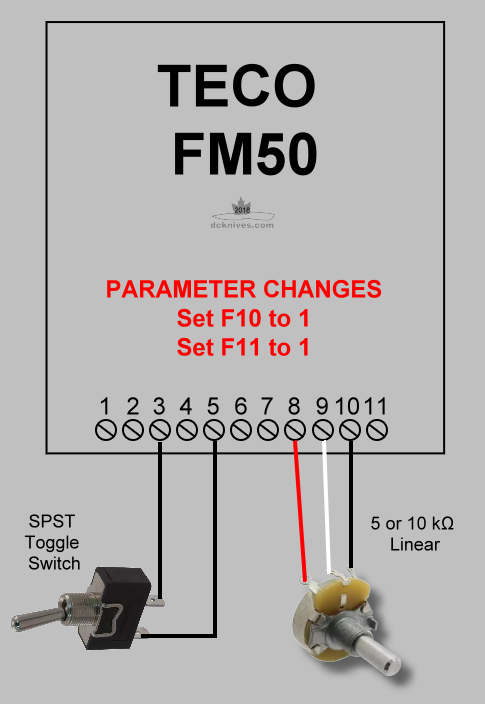 Your VFD manual will describe which inputs to use for the switch and for the speed control. 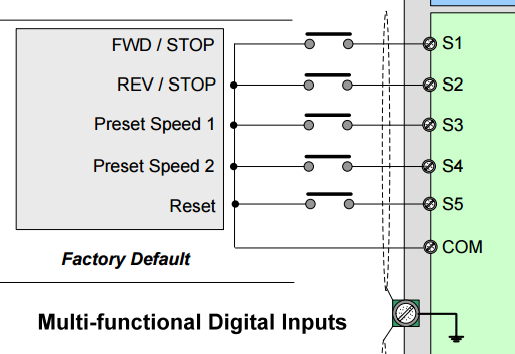 Most VFDs will have what is called a "multi-functional" inputs and outputs, meaning they can be programmed within the VFD to behave differently for a host of applications. 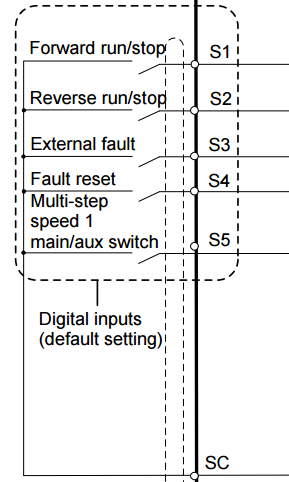 Multi-functional inputs may be labeled S1, S2, S3 and so on. This is from TECO Westinghouse's L510 Instruction Manual. 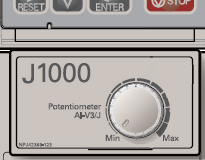 This is from Yaskawa's technical manual for the J1000 VFD. Did you notice the similarities between the two manufacturers control terminals? They both use S1 to S5 as the inputs and feed them with a single common line, one called COM and the called SC (switch common). This scheme is prevalent with industrial VFDs. 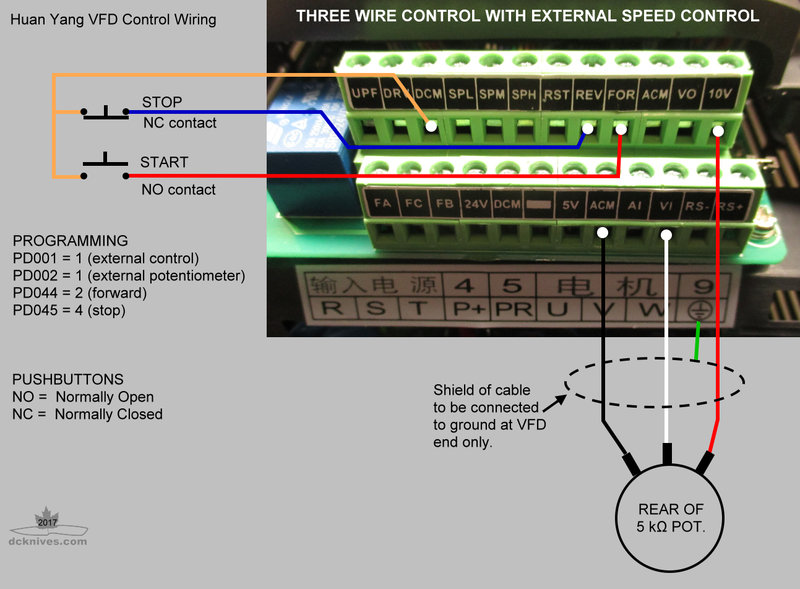 Huanyang VFD wiring for two wire and external speed control. 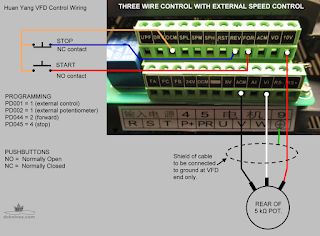 Huanyang VFD wiring for three wire and external speed control. * Note: If you want a forward/reverse control, add another toggle switch. The parallel cable as a lot of wires, but we only need five of them. The ones we don't use we can simply tie up and leave them for future use. 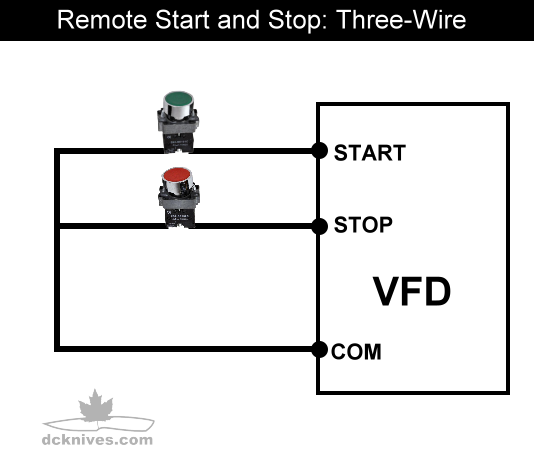 For the basic two-wire remote, I have chosen some wire colors. Whatever colors you select, write them down as you'll be connecting them a both ends. 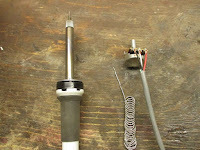 Before installing the variable resistor, I cut the shaft down to about 1/4". This is so the knob doesn't stick up too high. Slip the cord grip over the cable jacket. Separate the wires you need aside, then coil and tape up the rest. The shield wire should be cut or taped off as well. Install the cord grip into the utility box and tighten the grip on the cable jacket. 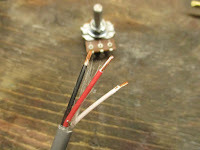 Carefully strip about 3/8" of the insulation and feed the wire through the terminal and loop it back on itself to make a mechanical connection. Flow solder into the joint. Note the wire colors as seen from the back. 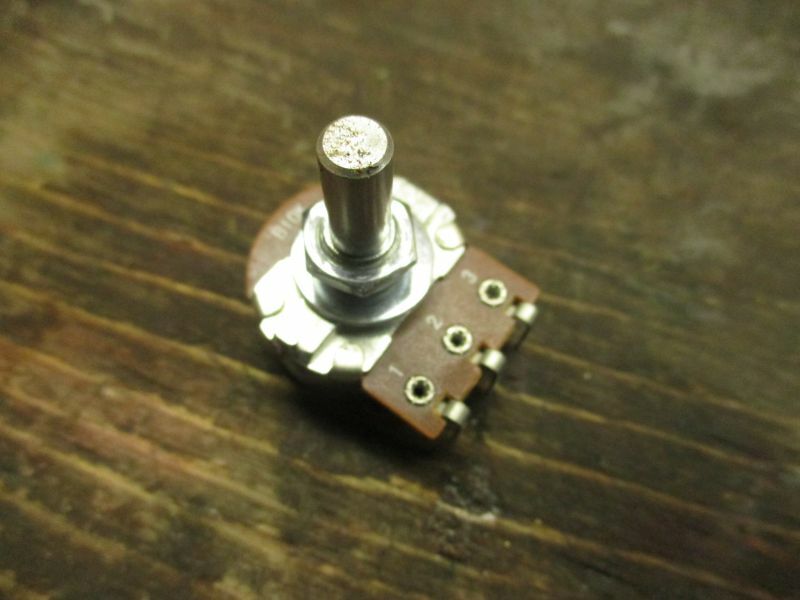 These need to be consistent as we want to speed the motor up when rotating the knob clockwise. To help secure the wires I added some electrical tape. A blob of hot glue would work as well. I crimped a red fork lug on to the orange and grey wires and screwed them on to the toggle switch terminals. If the wire is really small, fold it and twist it back on itself. This side is ready to be installed at the point of use. You can mount it on a bracket and add a nice graphic to it if you like. At the VFD end of the cable, take the wires out again. This time we need the shield wire. 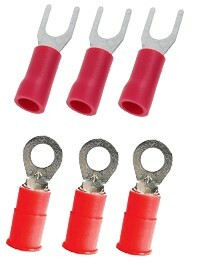 If your VFD has control terminals that take fork lugs, strip and crimp each wire with a red fork lug. If your VFD has wire clamp terminals, you may strip the insulation and fold the wire back on itself, twist and insert into the terminal and screw it tight. 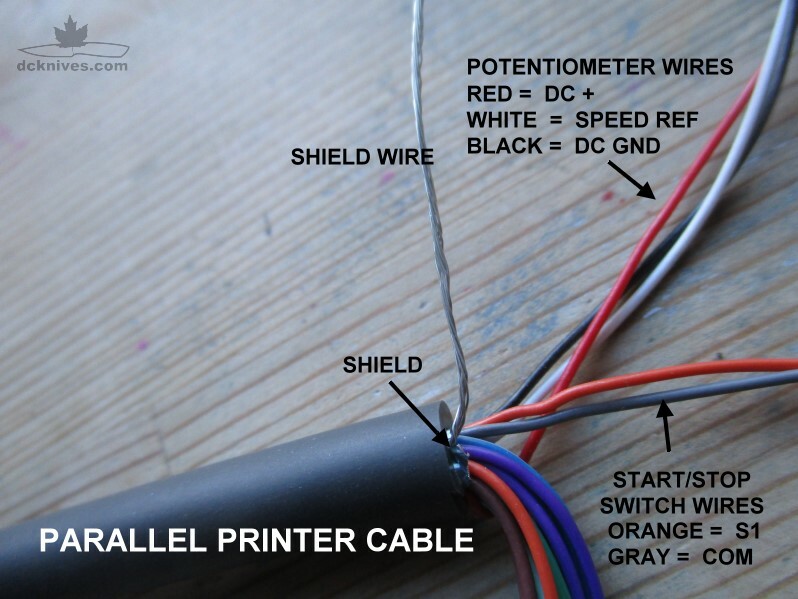 Here is the guide for the L510 and the wire colors we are using for our remote. 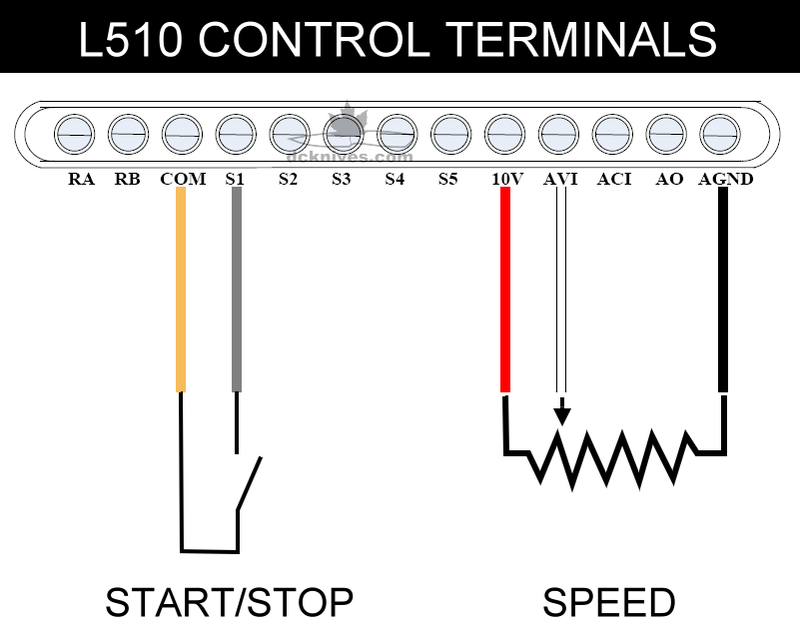 By default, your VFD probably looks at it's built-in keypad for starting and stopping and speed control. 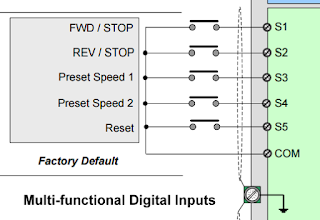 You will have to adjust (typically two) parameters to "tell" the VFD to look somewhere else for commands. 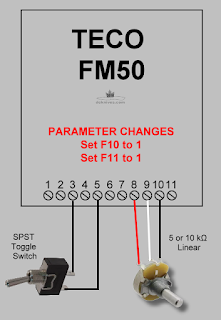 Your VFD manual will have a table that identifies what parameter to set. Here we are looking for two parameters. As there are many different manufacturers and models it's hard to show them all, but typically they have similar names. 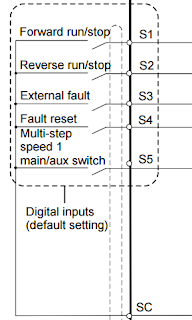 The table below is from the L510 instruction manual. 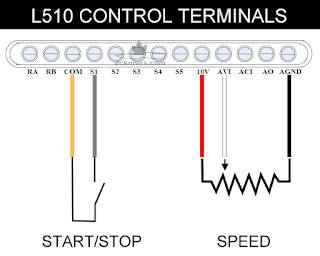 For the TECO L510, we need to set parameter 00-02 to a value of 1 (External Run/Stop) and parameter 00-05 to a value of 2 (External AVI Analog Signal Input). This should get your remote control functioning. There are a pile of VFDs out there. I will add some hookup information for some of the more popular ones below. These are the manuals I referenced in this tutorial. Let me know if you have any comments of questions. You can use any cable that has some shielding. The shielding is meant to reduce the noise on the low voltage signals. 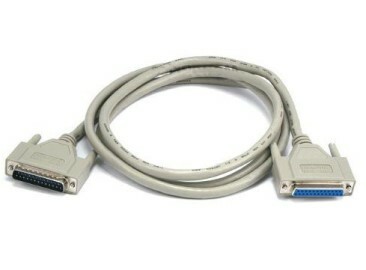 If you have better cable (5 wire or 3 pair) then yes, go for it. Some guys use two separate cables. 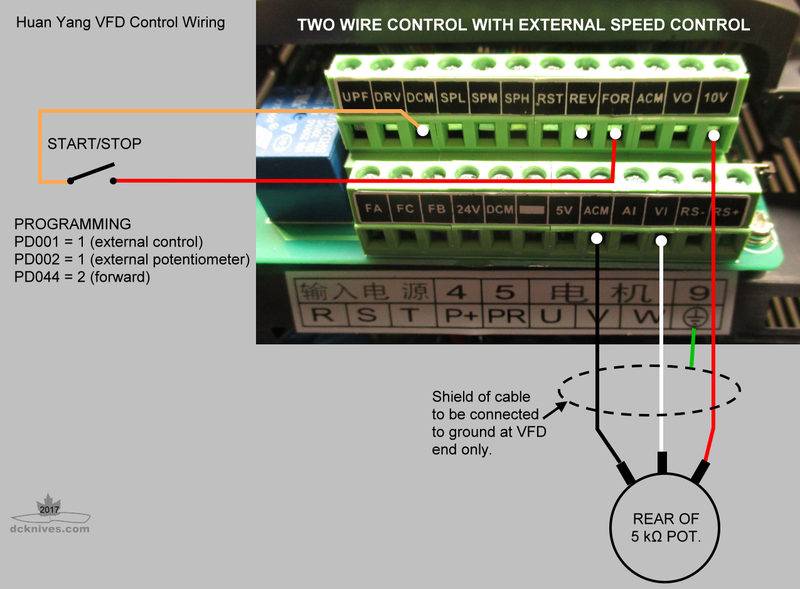 One with three wires for speed, and another with two wires for digital on/off. Thank you so much for posting! Helped me immensely!